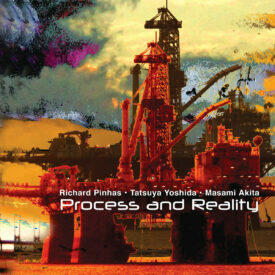 Meanwhile, here is French avant-garde guitar maestro Richard Pinhas’s take on the book, performed with Japanese noise master Tatsuya Yoshida (a.k.a. Merzbow) and drummer Masami Akita. Three of the album’s four tracks can be heard here. Deliberately titled after Alfred North Whitehead’s seminal 1929 book, this encounter is an intense reaction to, and dark prophecy about, the state of the world as it comes apart, with certain historical referents: The Paris attacks in November 2015, the pessimistic spectacle of America’s 2016 presidential election, ecological disaster, global terrorism, the wave of fascism emerging across Europe in the wake of the Syrian refugee crisis, and the unstoppable evolution of technology as it simultaneously creates dependency among the very workers and societies it displaces. This four-part work is comprised of throbbing electronic drones, loops, industrial, harmonic engagement, wave-like pulses of sound, furious rhythms, squalling, distorted guitar and machine feedback, and masterful control of space and texture. The sonic flow operates as an exchange of information and emotion between musicians. They find the seams between assemblage and dissolution and split them to birth violent, often beautiful possibilities. For Whitehead, reality was “always in the process of becoming.” Pinhas and his collaborators turn this on its head: becoming is always the ground for a new and present reality, one that equates pessimism and entropy as elementary parts of the force of re-creation. [. . .] The trio engage in intuitive, communicative improvisation as they exchange and dissolve present sonic articulations in favor of emergent ones. The divisions between individual pieces don’t matter — they are marks on a map of a soundworld that denote deeper entry into the work’s exploration of the terrain as it is given form. The trio embrace chaos as reality, and as such, they become a single voice. The myriad and diverse musical tongues eventually evolve into not only the acceptance of chaos but its logical evolution: an end that swallows everything. Truly remarkable. Although practically inaccessible to the layman, this seminal work in mysticism is nonetheless one giant jump forward for human thought.